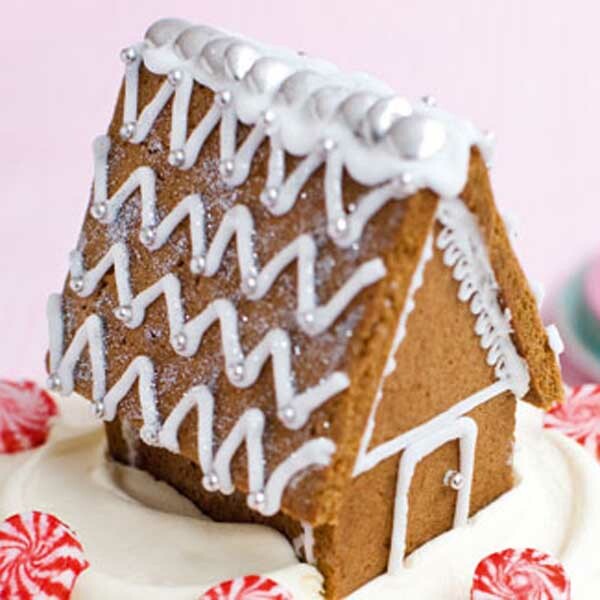 Gingerbread houses are deceptively simple to make and are so creative. Make one as a centrepiece on a cake or on the festive table. 1. Preheat the oven to 200°C/fan180°C/gas 6. 2. In a pan, melt butter, dark muscovado sugar and golden syrup. 3. Mix plain flour, bicarbonate of soda and ground ginger in a big bowl. Pour over the butter mixture and stir to a stiff dough. 5. Space out on a lined baking sheet. Bake for 10 minutes or until just firm, then allow to cool for a couple of minutes before trimming again. Cool completely before assembling. 6. Mix 1 large egg white with sifted icing sugar to make a smooth, thick icing. Fill a piping bag and pipe generous lines to join the four walls together. Allow to dry before adding the roof. Dry completely before decorating as you like.